MIAMI — Hurricane Danny is losing steam do to shearing effects from a dry upper atmosphere but was still considered a powerful storm today. The first hurricane of 2015 in the Atlantic continued its westward march towards the Virgin Islands while losing some of the intensity that made it a Category 3 hurricane at its peak. Danny was still a Category 2 hurricane with 100 mph winds on Saturday morning, however. The small storm was located about 740 miles east of the Leeward Islands as of the 4 a.m. CDT advisory from the National Hurricane Center. The hurricane was moving with a forward speed west-northwest at 10 mph. 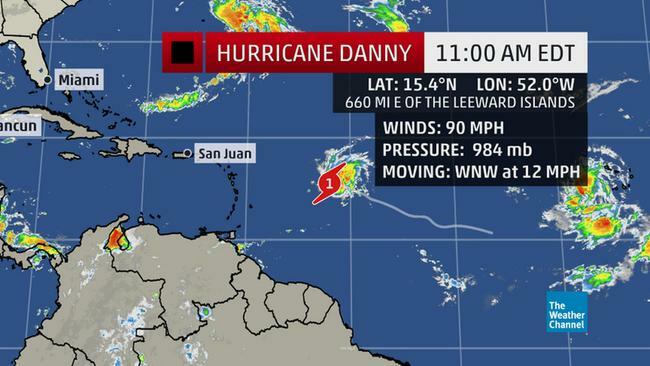 The hurricane center said Danny would take a turn more to the west and speed up on today. 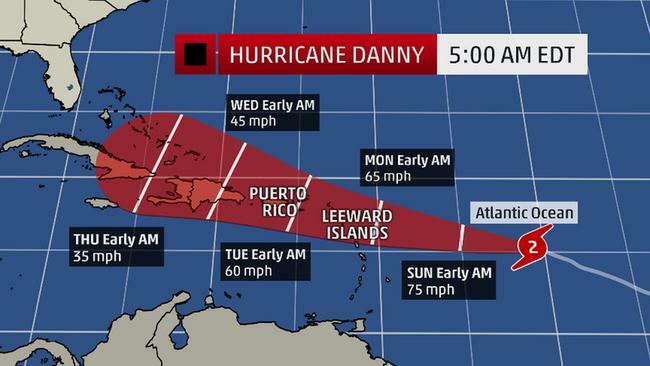 On that path Danny will pass through the Lesser Antilles on Monday — to include the U.S. Virgin Islands — and close to Puerto Rico on Tuesday. Forecasters expected Danny to be a tropical storm by then. The hurricane is moving in an environment with drier air and increased wind shear, which should induce steady weakening. In fact, the hurricane center said Danny should weaken to a tropical storm by Sunday. Nevertheless, forecasters warned those in the Leeward and Virgin Islands to watch Danny carefully and said tropical storm watches will likely be issued later today. The hurricane center said that reconnaissance flights from NOAA and the Air Force Reserves will each fly into Danny later today to get a closer look at its intensity and structure. NHC Monitoring Invest 90L To See If It Becomes Season’s First Named Storm … In May!